Antony Beevor’s account of the Spanish Civil War was No.1 on the country’s best-seller list for 23 weeks, even though it ran to 900 pages. A new generation is awakening from the long slumber of el pacto de olvido - “the pact of forgetting” which was imposed following the death of Franco in 1975. In July this year, on the 70th anniversary of the military rebellion which sparked off the civil war, Spain’s Socialist Party prime minister, José Luis Zapatero broke the 30-year-silence over the history of the civil war, a compromise on which Spain’s constitutional monarchy is based. His proposal for a Law for the Recovery of the Historical Memory has aroused fierce controversy. What really happened to their parents and grandparents has become a burning issue, especially as mass graves of Civil War victims are being exhumed and identified for the first time. But this is not a Spanish question alone. The Spanish Republic was on the front line of the fight against European fascism and its defeat made another international war inevitable. Today, when democratic rights are under attack and authoritarian rule once again threatens, it is important to revisit the experiences made in the cauldron of the Spanish Civil War. The social and political convulsions that epitomised Spain in the first half of the 1930s were shaped by the country’s earlier history, in particular a decadent and parasitic aristocracy, a powerful Roman Catholic church, and a backward economy. After the Wall Street crash of 1929, Spain was hit hard by an agricultural crisis which directly affected the 70% of the population who lived on the land, mainly on large estates. A million and a half workers and peasants were unemployed by the end of 1933. The relatively weak Spanish capitalist class had never succeeded in integrating the country’s more industrially-developed regions, particularly Catalonia and the Basque country into a unified economy. As a result, the Spanish state machine remain enfeebled and the army was the most powerful institution in the land. Following a crisis in ruling class circles and an election which led to the departure of the King, Spain’s Second Republic was proclaimed on the 14th of April 1931. The rise and fall of this republic was to inspire and terrify onlookers in the rest of the world in equal measure. The collapse of the monarchy signalled the start of an on-going social revolution, on the one side by the bourgeoisie against the remnants of feudalism, and on the other side by workers struggling for a socialist revolution against the capitalist employers and landowners. “The collectives in republican Spain were not like the state collectives of the Soviet Union. They were based on the joint ownership and management of the land or factory. Alongside them were socialised industries, restructured and run by the CNT and UGT [trade union federations] as well as private companies under joint worker-owner control. … There were estimated to have been 100,000 people involved in co-operative enterprises in Catalonia alone before the civil war. An American journalist, the Trotskyist Felix Morrow, described how “every district, town and village created its militia committees, to arm the masses and drill them… The old municipal administrations disappeared, to be replaced, in general, by agreed-upon committees giving representation of all the anti-fascist parties and unions”. He explained how in Catalonia, for example, the Central Committee of Anti-fascist Militias rested on the workers’ organisations and militias, “unlike”, he wrote, “a coalition government which rests on the old state machine”. Andrés Nin, who with Joaquin Maurín created the Workers Party of Marxist Unification (known as the POUM) in September 1935, described the situation in these terms: “The government does not exist. We collaborate with them, but they can do no more than sanction whatever is done by the masses.” Thus a vacuum of power had opened up. This was an intolerable situation for the bourgeoisie and, in particular, the military. Matters were soon to come to a head following the elections of 1936. CNT-FAI trade unions fighting together. 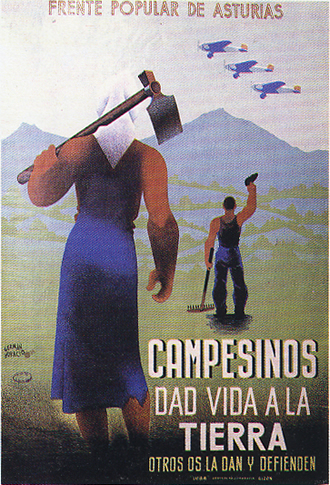 Men and women, with factories and the flag of the Spanish Republic behind them. In January 1936, an electoral pact was signed by the Socialist Party and the Communist Party, and Manuel Azaña, who was the leader of the liberal bourgeois Republican Party. The pact became the Popular Front which was elected to power in February 1936. 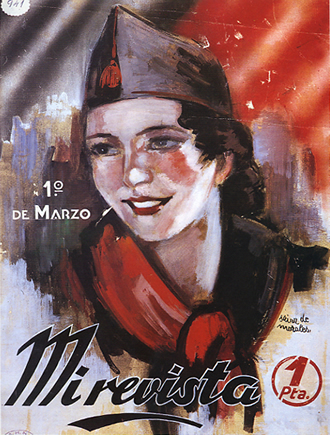 The Front was an electoral coalition that brought together six parties, including the Spanish Socialist Workers Party (PSOE), the Workers General Union (UGT) led by Largo Caballero, the Communist Party of Spain (PCE) the Workers' Party of Marxist Unification (POUM, independent communist) Republican Left (IR) led by Azaña, and the bourgeois Republican Union Party (UR). It received support from the Galician and Catalonian nationalists as well as the anarchist trade union, the CNT. Thus, the Popular Front was a coalition between the workers’ organisations and the parties representing elements of the capitalist class. The leaders of the workers’ organisations hoped to rescue the disintegrating and minimal organs of the capitalist state, including its armed forces, rather than develop the independent and democratic forms of rule that had spontaneously sprung up. This was in line with the policy emanating from Stalin’s Kremlin. Communist Party members throughout the world were instructed to make alliances with bourgeois political parties on the basis that this was the best way to face the threat of fascism. In this way, the political phenomenon of fascism was separated from its capitalist parents. This reactionary policy would undermine the Republic over the next few years. The Spanish Popular Front government was elected by a narrow margin of 2% over its right wing opponents in February 1936. It was the signal for an offensive by General Francisco Franco, the chief of general staff, or El Caudillo as he became known. A nationalist military uprising, led by him and General Manuel Goded y Llopis began on July 17, 1936. Its aim was to overthrow the elected government and establish a dictatorship of the armed forces and to resurrect the monarchy. For two crucial days Azaña’s Popular Front government pretended to the country that it was in total control and refused to arm the workers as the trade unions requested. While their leaders waited in vain for the government to give the signal to them, the workers of Barcelona and elsewhere themselves prevented the Nationalists and fascists from taking control of their towns. As Beevor shows, each area had different experiences and struggles. He demonstrates graphically how finely balanced the mood was within the Civil Guards and the Assault Guards within each garrison. Decisive action against the Nationalists through the distribution of arms to the workers was crucial. Equivocation was fatal. There was, as Beevor describes, a disintegration of the mechanism of state, “when so many of its functionaries, from the diplomatic corps to the police, to say nothing of the armed forces, supported the nationalists”. But in Beevor’s portrayal of the fast-moving and contradictory flow of events, it is possible to miss an essential truth. The fascist-nationalist military uprising of July 17 succeeded where it did due largely to the conciliatory attitude of the Popular Front leaders. The Popular Front leaders Azaña, Indalcio Prieto and Niceto Zamora, tried repeatedly and unsuccessfully to persuade the military to support the democratically elected republic. While Spain experienced social revolution and military uprising, in the USSR Stalin’s counter-revolution was devouring countless victims, many of them revolutionaries, others the flower of Soviet culture in the sciences and arts, in the Moscow Trials of 1936-1937. The heart of the officer corps was torn out of the Red Army in Stalin’s purges of the military as Marshall Tukhachevsky and thousands of others were executed in the summer of 1937. And it was from Moscow that the Spanish Communist Party took its lead. Beevor relates that one of the chief controllers of the International Brigades (see below), André Marty, had a “conspiracy complex that rivalled Stalin’s. Influenced by the show trials in Moscow, he became convinced that ‘Fascist-Trotskyist’ spies were everywhere”. It was a two-way process, as the paranoia was exported to Spain, Machiavellian conspiracy theories made there served to accelerate the purges in the Soviet Union. Spain was by now split into warring zones, some held by the Republican anti-fascists, the others by the Franco-led Nationalists. 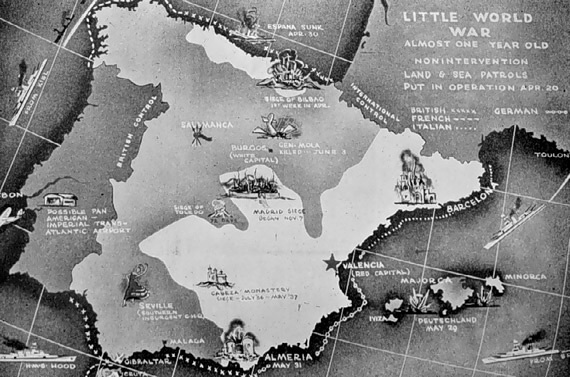 The latter took control of most of the north west Atlantic area, apart from the Asturias, the Basque country, and Cantabria. The Republicans held most of eastern and central Spain. As Spain bled, the attitude of other governments, especially Britain, was crucial. From the start, the Foreign Office warned the French Popular Front government not to help the Republic on the grounds that this would encourage Hitler and Mussolini to aid the Nationalists. The hypocritical policy of non-intervention and appeasement only made it inevitable that Hitler would eventually turn his attention to Britain. Hitler and Mussolini were left free to supply and arm Franco unstintingly, with German and Italian bombers playing a decisive part in the outcome of the war. And behind the United States’ official policy of neutrality, companies like Texas Oil supplied Franco with 3,500,000 tons of oil on credit during the war. Ford, Studebaker and General Motors supplied 12,000 trucks while chemical giant Dupont of Nemours supplied bombs. On the other side, the fabled military support provided by the Soviet Union was too little and too late – and generally of poor quality. In addition, whilst the Nationalists received vast supplies on credit from the US and Britain, Stalin’s assistance came with strings attached. One of the Republic’s greatest assets was its control of Spain’s gold reserves, 635 tons, the equivalent of $715 million, the fourth largest gold reserves in the world. Astonishing as it may seem, in September 1936 over 72% of the Republic’s reserves were secretly shipped to Moscow as a “current account” to pay for arms and other expenses. The man who masterminded the operation was the NKVD agent General Alexander Orlov. The only people in Spain who knew about the smuggling out of the gold were President Azaña, Prime Minister Largo Caballero of the UGT and Finance Minister Juan Negrín. Beevor notes, “nothing was free and many charges appear to have been exaggerated to say the least”. The Soviet Union made a considerable profit out of the deal. And as the International Brigades were struggling desperately on the ground, Stalin continued selling oil to Mussolini whose air force rained bombs on the Republican forces. By 1938 the Republic’s appeal for military assistance was a low priority for Stalin. Even arms paid for in advance through a second shipment of gold never reached Spain. In a section devoted to the famous International Brigades which were organised by the Communist International at the end of July 1936, Beevor writes: “... The selflessness of the International Brigades cannot be doubted. They saw fascism as an international threat and the Brigades appeared to offer the best way of fighting it. Spain was seen as the battleground that would decide the future.” Volunteers from 52 countries flocked to help the young Republic, largely but not entirely, recruited by the Brigades. Young men also left Italy to join the other side, not so much out of idealism for Franco but to escape the dire poverty that affected them. A cruel reality was to confront the 32,000-35,000 “foreign innocents” – mostly young workers, but also talented intellectuals - who had left Britain, the US, Germany (already under Nazi rule) and eastern Europe and made the long journey to fight for the Republic. The shock they experienced has been brilliantly depicted in Ken Loach’s 1995 film Land and Freedom. Their lack of training and fighting experience was matched by those of the Spanish militias who did not even have the benefit of Great War veterans. On the Soviet side, advisors were “ so junior that they had as little experience of command as the Spanish officers they were supposed to advise”, Beevor notes. The reports hitherto buried in Soviet archives reveal the horror of Stalinist methods of “maintaining discipline” at the front line, which meant setting up machine guns behind the lines to shoot down anyone on the Republican side who wavered. As Beevor writes: “Every blunder was attributed to deliberate sabotage”. Thousands of so-called “fifth columnists” were shot or sent to punishment camps. The heaping up of disaster upon disaster was blamed on an imaginary “fifth column” amongst the troops themselves. In reality, as Beevor shows, it was due to a total lack of strategy as well as poor weapons and supplies. Detailed accounts of the legendary battles of the Jarama, Guadalajara, Aragon, Brunete, Teruel, the Ebro, and the battle for Madrid show incontrovertibly that even when gains were made, the Republican forces could not take advantage of them, as they had virtually no understanding of the art of war. Nor were they able to learn from their mistakes. The Republican forces were initially bolstered by the enthusiasm, selflessness and support of the people in the areas they controlled. But there was no clear strategy for taking over and running the state as a whole – or rather establishing a new, democratic form of people’s power. Very rapidly, the Popular Front government which appeared so left wing, constantly undermined and repressed the very workers it needed to keep itself in power. At the same time, Stalin’s secret police, the NKVD, crippled the revolution by murdering its leaders and cadres. By the spring of 1937 the “civil war within the civil war” reached a fever pitch. Or put another way, there was a counter-revolution within the revolution. 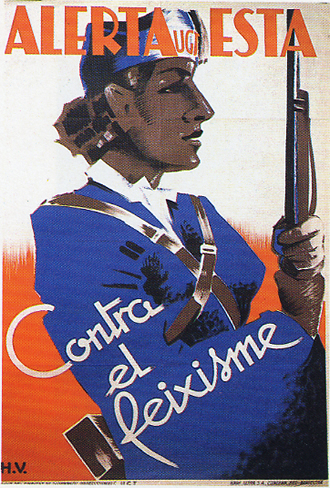 The sharpest confrontations were in Barcelona during the 1937 May Days. Lluís Companys, the Catalan president, had led an uprising against the centre-right wing Republican government in 1934. But in December 1936, under the influence of the Stalinists, he sacked the leader of the POUM, Andrés Nin from the Catalonian government. Now, along with Juan Negrín, he sent Assault and Civil Guards against the workers of the CNT (Confederación Nacional de Trabajo – the anarcho-syndicalist trade union) militias in order to seize back control of Barcelona’s telephone exchange, the Telefónica. As Felix Morrow wrote, it was the symbol of workers’ power in the city and a concrete instance of the dual power situation that prevailed. There was a capitalist coalition government but the city of Barcelona was in the hands of the workers. Within two hours of the troops being sent, workers poured into the centre of the city, erected barricades and overwhelmed the paramilitaries by the end of the next day. The Prime Minister, Socialist Party leader Largo Caballero, now sent in the Assault Guards all the way from the front on the Jarama river near Madrid. Two squadrons of fighters and two of bombers were sent to Barcelona’s airfield at Reus against the insurgents. In response a pamphlet written by the Friends of Durruti anarchist group together with the POUM, calling for a revolutionary Junta hit the streets of Barcelona on the morning of Wednesday, May 5. Then, over the heads of their members, the leaders of the anarchist CNT-FAI (Federación Anarquista Ibérica) appealed for a ceasefire and on May 6th proposed a pact with the government and a military climbdown, hoping for a compromise solution. When truckloads of 5,000 Assault Guards arrived on Friday, May 7, the CNT appealed for law and order and barricades began to come down. Meanwhile, the Stalinists described the workers’ resistance as a “putsch” and claimed that the “people from the POUM are working for Franco and Italian and German fascists”. The NKVD under Orlov spread a grotesque fantasy about a conspiracy between the Trotskyists and Anarchists working together with the fascist Falange-Espanola. The extraordinary events were recorded by the English writer George Orwell, who was in the POUM militia, in his book Homage to Catalonia. Beevor writes: “The collapse of CNT and POUM influence allowed the judicial system in Catalonia to be reorganised. Joan Comorera the communist councillor of justice, introduced Special Popular Tribunals, which were more like military tribunals. The following month, under the authority of the central government, a Special Tribunal for Espionage and High Treason was set up.” Tens of thousands were arrested , held in state or secret prisons and labour camps. There were many more battles to come in the rest of Spain. A single pattern emerges again and again from Beevor’s detailed but highly readable military analysis. Although the Nationalist forces enjoyed superior material support, the greatest damage to the Republic was done from within, and not only by the counter-revolutionary activities of the Comintern “advisors”. Mistaken and misguided perspectives proved disastrous on the battlefields themselves. “The idea that the only possible strategy consisted of set-piece offensives…. Proved to be almost as grave a liability as the militias’ belief in the triumph of revolutionary morale. … Once the attack had achieved surprise, the People’s Army commanders then allowed the momentum of the offensive to be lost by besieging villages and small towns,” Beevor notes. Propaganda claims of victories were more important than the reality on the ground. “Thus the Battle of Brunete, Belchite, Teruel and the Ebro were all disastrous repetitions,” he concludes. Despite bitter fighting and heroic sacrifices, region after region was recaptured by the Nationalists during 1938 and 1939. At the end of February, British Prime Minister Neville Chamberlain recognised Franco’s government and on 27 March 1939 Madrid fell to the Nationalist army signalling the end of the war. Beevor is one of the most gripping chroniclers of epic military confrontations which changed the course of the 20th century. His books about the battle of Stalingrad, the fall of Berlin and the struggle for Crete have brought the events of World War II into close-up focus for a mass readership. He is unsparing in showing how military and political leaders – whether German, British, Soviet, Italian or Spanish – sent millions to their deaths. Even when their aims were to defeat Nazis or Fascists, incredible blunders and disregard for the lives of fighting men and women caused untold millions to die unnecessarily. He succeeds in assembling a wealth of detail while making military strategy and tactics understandable to the lay reader. In addition, with the help of Russian colleagues, he has mined the newly-opened archives of the former Soviet Union, and those in other countries, to bring to light the inner workings of events as well as the rationale (or lack of it) of those who made the key decisions. He is good at revealing the interplay of the big picture, the broad strokes of the canvas contrasting with the detail of individual destinies. But in political analysis Beevor tends toward a non-dynamic and simplistic view of the underlying forces which shape history. He tends to detach the political and the military from the living conflict of social forces. If only, Beevor muses, the Spanish could have reached some kind of compromise that might have avoided the nightmare of the Civil War. But the dream of a right-left balance is a similar trap to that of the Popular Front. He gets ensnared in the violent see-saw of the clash of interests and reacts to the violence from the point of view of a defender of parliamentary democracy when the conditions for it actually did not exist. Franco’s military uprising really was as a reaction to what Beevor describes as “the fear of Bolshevism”. 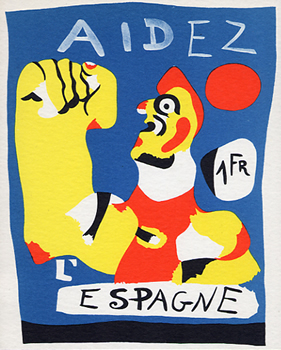 The need for a state that would rule by brute military force, bringing the autonomous regions under its sway, was paramount for Spanish capitalism, faced as it was with a people’s revolution. The choice was between advancing the mass revolution by creating new organs of state power or succumbing to the military dictatorship and all which that entailed – 40 years of brutal rule until the Caudillo’s death in 1975. Franco and his forces had a clear objective – to seize control of the state. The forces of the Republic were crippled by vacillating leaders at all levels. Again and again they looked to the existing state, including the armed forces for protection against the spontaneous power of the workers in the town and country. The reality is that then, as now, the capitalist state will seek to protect itself even if it means dispensing with democratic rights and institutions it has previously championed and legislated for. The course of events so graphically brought to life by Beevor, demonstrates that the outcome of the war was not predetermined. The actions of millions of people, leaders and led, rich and poor, political and non-political all contributed to and finally, decided the outcome of the Spanish Civil War. There was never any shortage of people ready to make sacrifices. But without a clear perspective for taking power independently of the remnants of the capitalist parties, heroism alone could not achieve victory. This vital lesson is as important today as it was 70 years ago. The Battle for Spain: the Spanish Civil War 1936-1939 by Antony Beevor is published by Weidenfeld and Nicholson at £25. Felix Morrow’s 1938 classic Revolution and Counter-Revolution in Spain was re-published by New Park Publications in 1963.